Reasoning Machine Input Output Question For SBI PO | SBI Clerk. New Pattern Machine Input Output. Welcome to the www.letsstudytogether.co online learning section. If you are preparing for SBI PO/Clerk 2018 and other competitive exams, you will come across a section on the Reasoning Ability. Here we are providing you “New Pattern Machine Input Output” based on the pattern for your daily practice. Directions: Study the given information carefully and answer the given questions. An input-output is given in different steps. Some mathematical operations are done in each step. No mathematical operation is repeated in next step. Find the multiplication of the first two numbers in step III? Step I: Write the difference of the digits of first table in the first cell and then in the second cell, write the difference of the digits of fourth table. 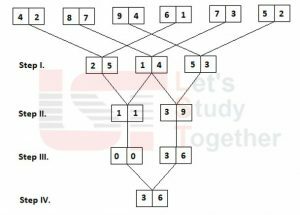 Perform the same operation for table second and fifth, and for table third and sixth. After this, step we are left with three tables. Step II: Write the difference of the numbers (considering the whole table) of first and second table. Then write the difference of the numbers of second and third table. After this step, we are left with two tables. Step III: Write the square of the difference of the digits in first table and also for second table. After this step, we are left with two tables. What is the final step of the given input? What is the difference between the numbers obtained in step II? If the value “8” is multiply with the final output’s first digit then what will be the resultant value? Which of the following represents the multiple of the first digit of the third value and the second digit of the First value in Step I of the given input? Direction – A word and number arrangement machine when given an input line of words and numbers rearranges them following a particular rule in each step. The following is an illustration of input and rearrangement. What will be the difference of the number which is second from the left end of step I and which is third from the right end of step III? In the given Input-Output one word and one number is being arranged simultaneously in each step. For Words- In first step- The word which comes first according to alphabetical series will be arranged from left end such that its first and last letter of the word will be replaced with its next letter and rest of the letters are replaced with their preceding letter. Then the next word according to alphabetical order will be arranged in second step from the left end and so on………..
For numbers- All the numbers are arranged with the one word simultaneously in each step, such that first the prime numbers are arranged in ascending order and then non-prime numbers will be arranged. Each of the number will be arranged by following logic as number will be replaced with the square of the addition of the digits of that number after arrangement. What will be the third step of the given input? Which of the following word/number will be third to the left of sixth from the left end in step II? 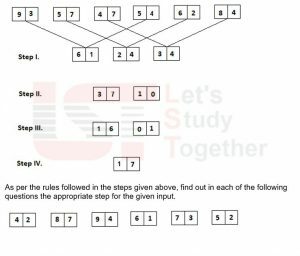 What will be the twice of the difference of sixth number from the left end of step I and fifth number from right end of step IV?